Another recent release that passed me by was the RS Models pair of a Ki-61-II Kai in the"bubbletop" (kit # 92104) and "razorback"(kit # 92105) versions. 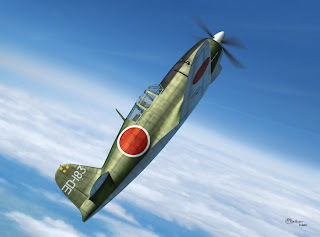 And there is a Ki-100 on the way too. 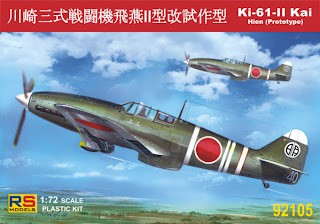 Something of a puzzle these releases as the Ki-61-II Kai "razorback at least is already available as an excellent Fine Molds kit (as is the Ki-100). 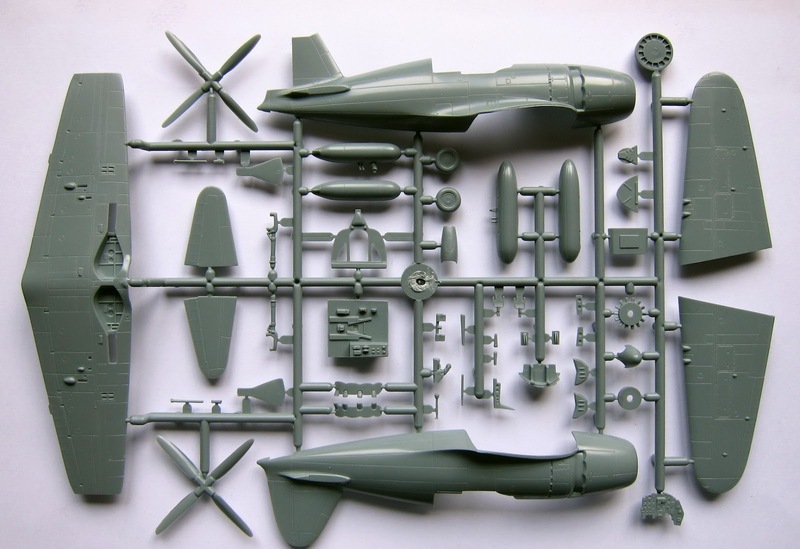 The RS Models kits are all plastic with no resin or photo-etch parts included. The "bubbletop", described as a Ki-61-II Kai Hien (Production type)" includes three markings options. 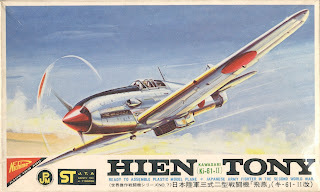 A genuine 56th Sentai example which is the subject of a well-known photograph and two imaginary birds - a 244th Sentai air-to-air rammer and a 55th Sentai example. Despite the paucity of available schemes the "bubbletop" always seems popular with modellers. The made up example on the RS Models website certainly shows off its attractive and unusual lines. 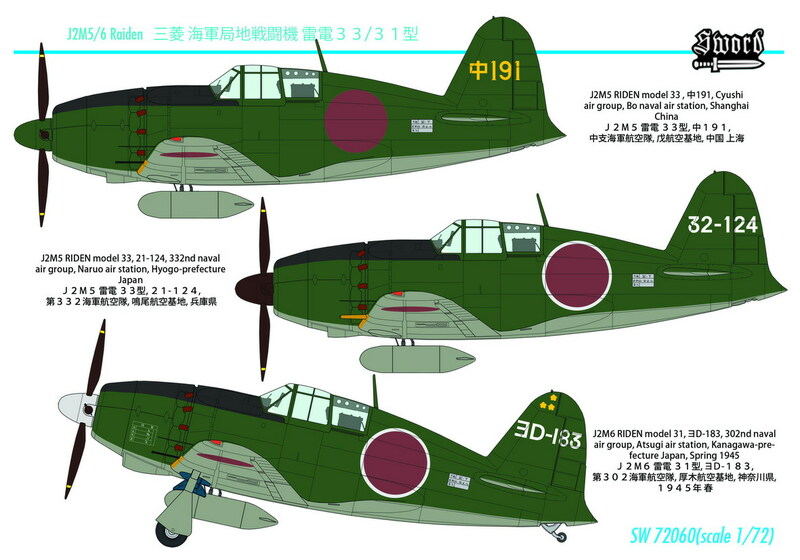 The "razorback", described as a "Ki-61-II Kai Hien (Prototype)", also includes markings for three options. 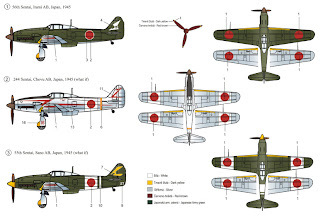 There are two imaginary schemes for a late war Akeno fighter regiment example and an aircraft of the 5th Sentai, but perhaps more interestingly the second option is for a B-29 killer from the Army Air Evaluation Centre at Fussa (now Yokota). But should that number on the tail be red? The Fine Molds Ki-61-II Kai "bubbletop" model was originally released in 1989, followed by the "razorback" in 1991. Each kit had a new frame of fuselage parts to be combined with parts from the Hasegawa Ki-61-I Tei which was also included in the box as a complete kit, with additional white metal detail parts consisting of a control stick, pilot seat, spinner, oil cooler intake and tailwheel. This arrangement seems to have been co-ordinated with Hasegawa as the instructions bear their logo and trademark details and there was a prominent Hasegawa sticker on each box. The distinctive monochrome box art was by Masao Satake who illustrates the Bunrin-do FAOW series covers. 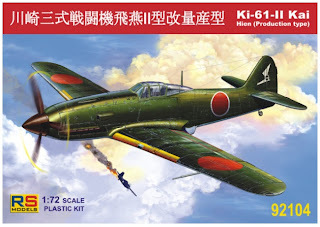 The Ki-61-II Kai "razorback" was subsequently re-released as a wholly Fine Molds branded kit in 2000 with the "donated" Hasegawa parts replaced by all new parts (a new Ki-61-I and Ki-100 "family" series had also been released) but somewhat surprisingly the "bubbletop" version did not also re-appear as expected. I say surprisingly because it is clear that the RS Models "bubbletop" sold out quickly and I have been unable to find one to review. 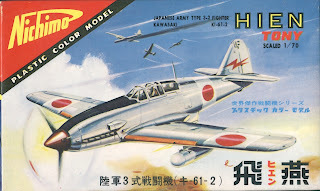 Way back in 1966 Nichimo also released a 1/70th scale Ki-61-II "razorback" (note the absence of the 'Kai' suffix) that was the only game in town until the Fine Molds kit appeared. It made up into quite a reasonable model for the time, especially if dressed up with Hasegawa Ki-61 parts and the small discrepancy in scale was overlooked. It is still worth a look for the "retro-minded" and to compare with the more recent kits. The re-released version of this kit (shown below and by then a "Japanese Safety Toy" so post-1971), only revealed its scale in very small print on the box sides. The contents were unchanged. For some reason the earlier edition seems to be easier to find. 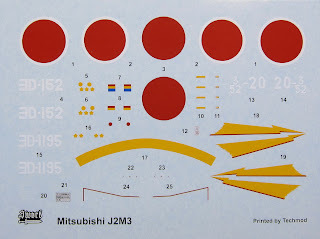 An earlier Fujimi kit from 1965 (issued under the Bachmann-Fujimi branding in the USA) also represented a Ki-61-II but was a much cruder kit than the Nichimo, poor in shape and with an especially hideous windscreen. 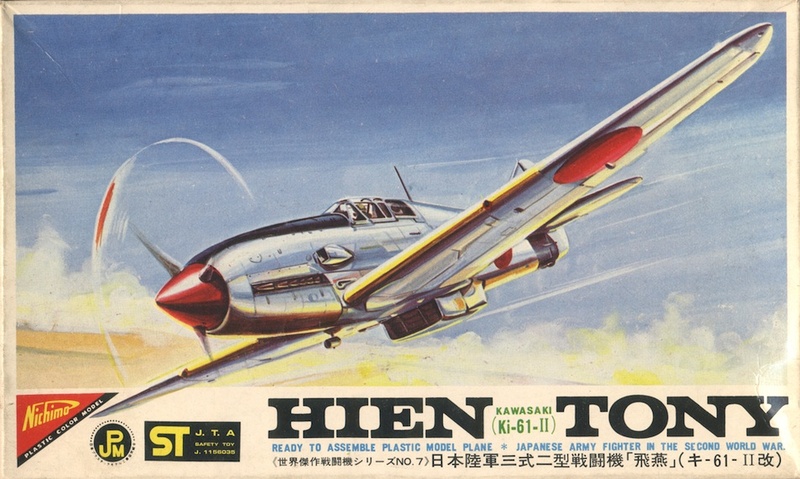 When first released in Japan the box art depicted a Ki-61-I but the later more familiar box art corrected this. It is sometimes confused with the Nichimo kit but they are radically different. 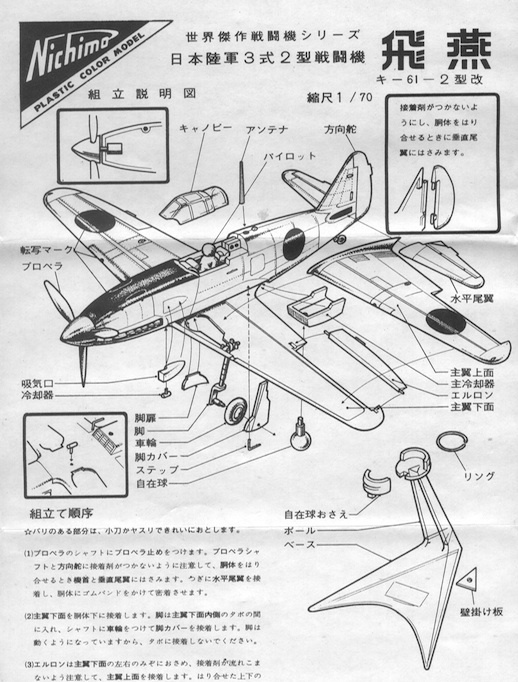 Fujimi's original Ki-61-II kit from 1965. Beneath the splendid box art lurked a horrible kit! 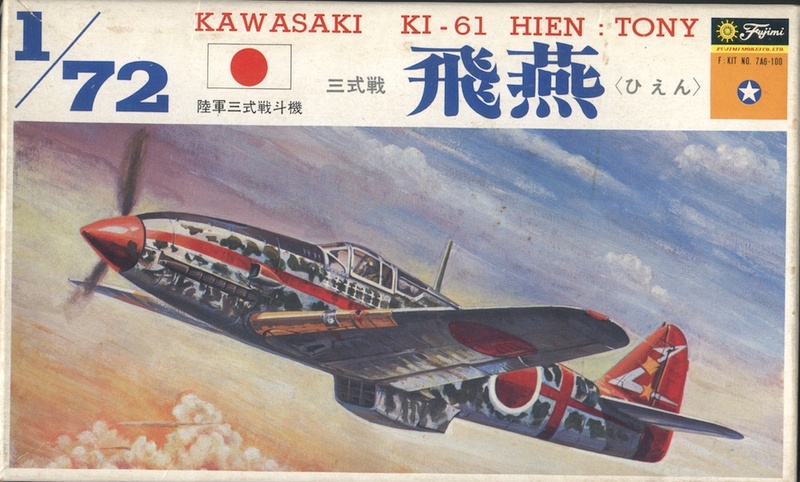 I have always been a tad suspicious of the Ki-61-II Kai designation (with no real evidence I hasten to add). 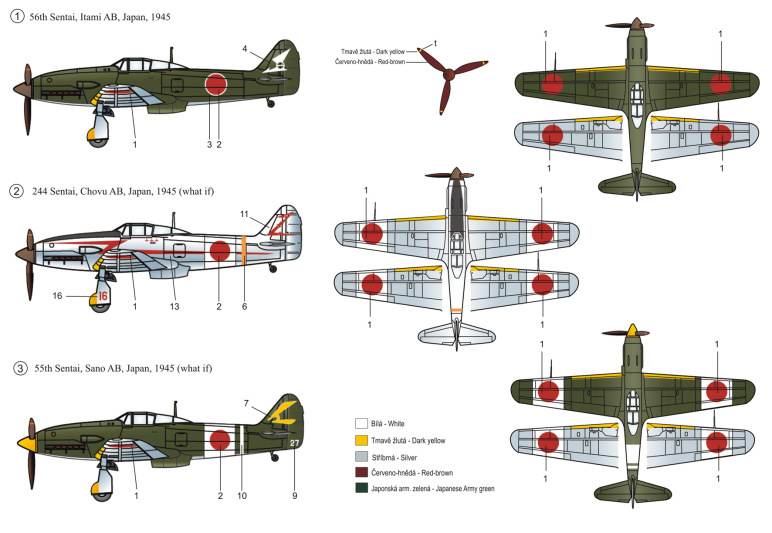 The Ki-61-II was reportedly a development with both the new engine in a lengthened, modified fuselage and originally a larger wing area, limited to eight examples actually constructed. 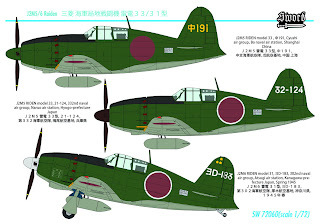 This combination supposedly proved unsuccessful so for production the new engine was combined with an airframe which reverted to the standard Ki-61 wing and was identified by the suffix Kai for kaizou (改造) meaning "modified" or "re-structured". The shortage of engines subsequently led to the Ki-100 conversions. I have long held a sneaking suspicion that there might have been no actual designation distinction between the eight original "big wing" and subsequent standard wing Ki-61-II versions - and that the Kai suffix perhaps referred to the "bubbletop" modification instead. 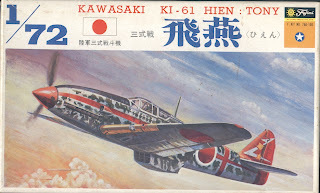 The early Osprey/Arco Aircam book on the Tony, published in 1971, offered a few profiles of the Ki-61-II of somewhat dubious provenance but there is an excellent research article by Don Marsh and Jim Long at j-aicraft.com recording the various colour schemes worn by the surviving # 5017 that might inspire alternatives or even a mini- collection. 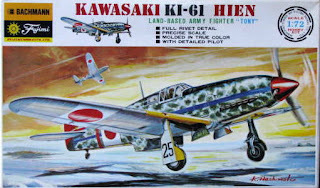 In painting scale models there is always a danger of reverse engineering a personal choice of paint colour on the model to have relevance to the real paint colour whereas it is perhaps better to use the real paint colour as the basis for the personal choice - having regard to factors like paint brand and type, scale, weathering, etc. That's not a criticism of personal choice influencing belief btw, merely an observation, but it is very prevalent amongst modellers, myself included. Colour in paint coatings is a two-way street. The paint surface absorbs and scatters light but the light reflected back to the observer's eyes depends on his or her receptors in order to see it. It's like a radio broadcast where despite the excellent quality of the transmission it will still depend on the quality of the receiver how the music sounds. Call it "subjective individual colour perception" which is the main cause of most online arguments about how the "colour music" sounds rather than what is being transmitted. Reflectivity depends on both illumination and angle which is why colour science theory depends on determining that in order to fix and define a specific colour. The light wavelengths reflected from the paint surface (and actually from within it too) depend upon pigment and particle size which determine their "colour". Metamerism inherent in a colour space is different from issues of "scale". 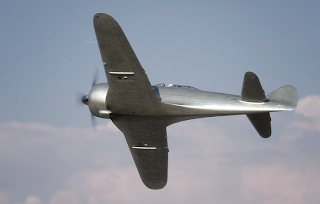 The same paint colour on a full-size aircraft and model will have the same metameric qualities because of the pigment type and particle size. The difference will be in plane (as in surface) size, angle and illumination. These contribute to the diffuse reflectivity by which the overall colour is recognised. 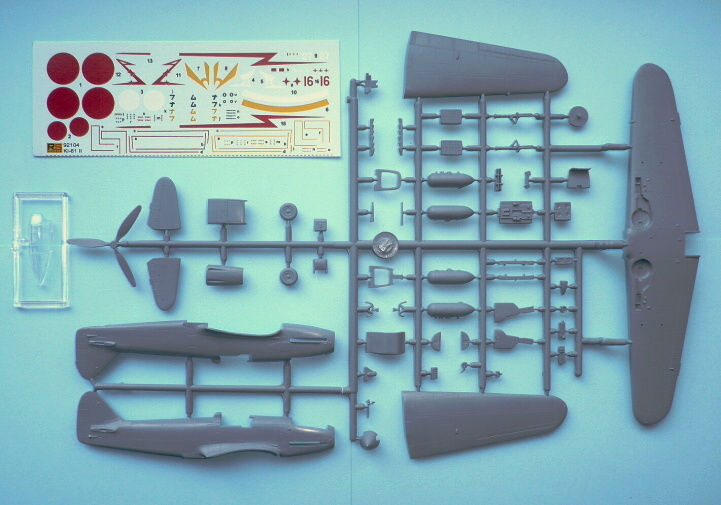 In other words the full size of an aircraft fuselage or wing reflecting light compared to the (comparably) small and multi-faceted model. However, beyond these perceptive differences and in order to communicate and identify it effectively colour has to be defined in measurable terms. Paint colour might look different dependent upon these various factors but will still have a definable, measurable "fixed" value in colour science terms. Otherwise it would be impossible to produce and manage paint colour to a consistency that is reasonable (even so variance is a factor almost impossible to eradicate and it is only relatively recently that manufacturers have managed to successfully integrate measurement and visual assessment to improve consistency). Modellers tend to focus on the reception bit rather than the transmission bit which of course means there can be a significant margin of error in perception and therefore replication. In reality hobby paint colour seldom matches the original paint in terms of pigment and almost certainly not in particle size. It seeks only to replicate or imitate the original appearance because there is always more than one way to skin a cat. 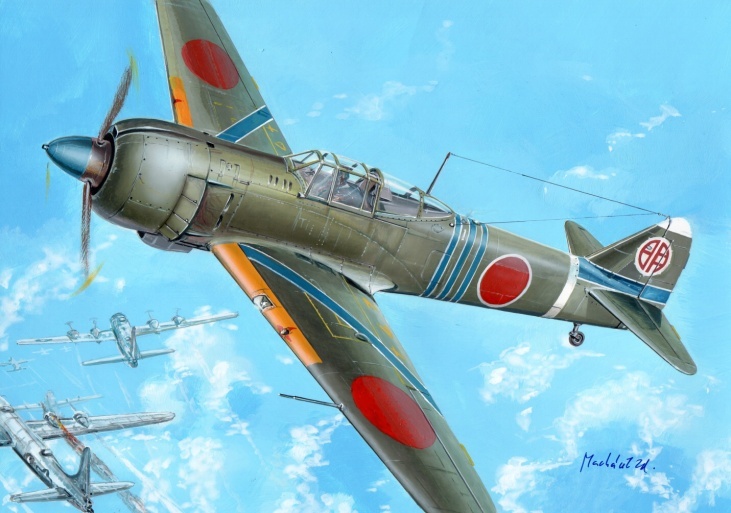 Some hobby paints have sought to build in "scale" or toned down colour with various degrees of success. 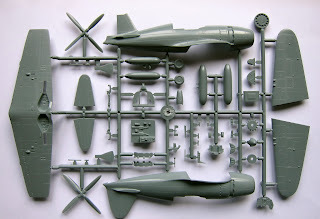 Modellers often do the same and there are various propositions out there for achieving the effect, some highly complex whilst others are straightforward and simple. 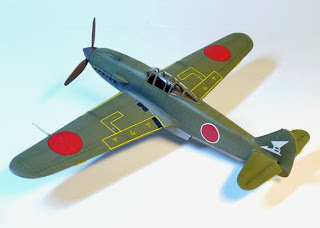 Therefore it is probable that the metamerism of paint on a model might be different to that on the original subject, even where paint of similar appearance is applied. In some cases it is apparent that attempts to "scale" colour, either by hobby paint companies or individual modellers, result in colour which is significantly different in hue to the original and does not replicate or even imitate it. The balance between artifice that looks right and accuracy that looks wrong is fragile! Apart from metamerism inherent in the paint colour there is metameric observer failure which is covered in the Zero e-guide on page 6. But there is another form of failure relevant to models which is called "field-size metameric failure". It occurs because the relative proportions of the three cone types in the retina vary from the centre of the visual field to the periphery, so that colours that match when viewed as very small, centrally fixated areas may appear different when presented as large colour areas. 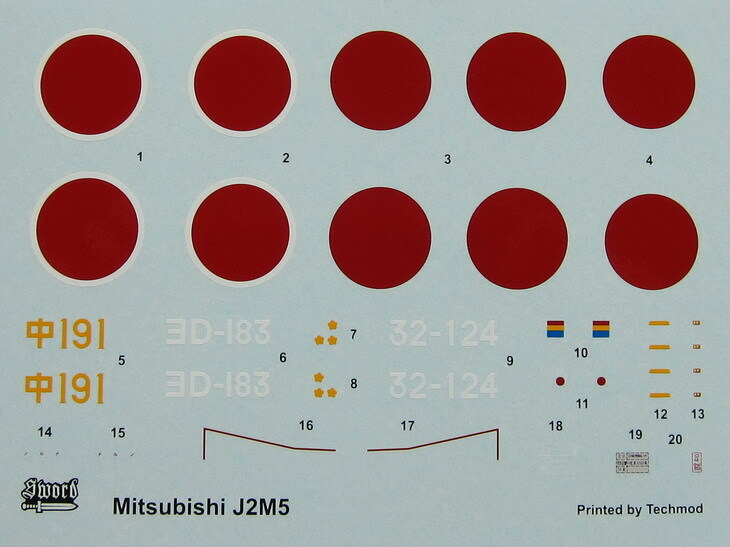 In many industrial applications, large field colour matches are used to define colour tolerances. 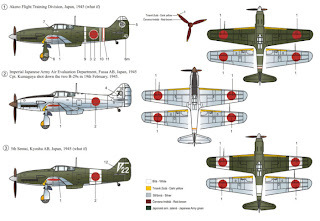 The main effect in models is where full-size paint colour swatches, relatively "small, centrally fixated areas" are replicated precisely resulting in models which often appear too dark. This is more relevant to issues of "scale" than any atmospheric distortion of light over distance. It is often surprising when viewing a colour swatch some distance from the painted object - a wall or door, say - and thinking "too dark", to find that when laid directly on the paint surface the swatch is identical. 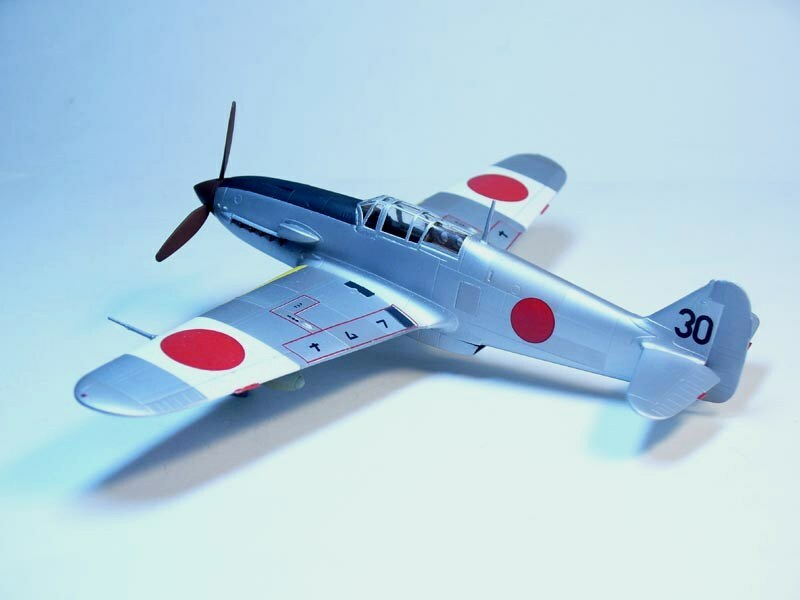 The reverse effect on a model is to match full-size, paint the model and then wonder why it appears darker looking than the real aircraft. That is perhaps the essence of "scale colour". Endeavouring to replicate the appearance of a "large colour area" on the "small, centrally fixated area" of a scale model. By matching two "small, centrally fixated areas" the result will always tend to look darker than it does in real life. 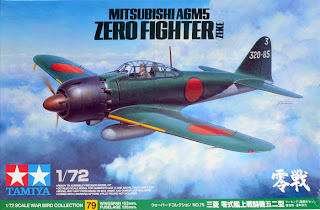 Having now had an opportunity to examine this superb kit in direct comparison with the "magazine-issue" Fine Molds version my suspicions about the cowling of the latter, expressed here, can be confirmed. The difference is subtle but the Tamiya cowling is slightly beefier in cross section with the upper line in profile not tapering so much. 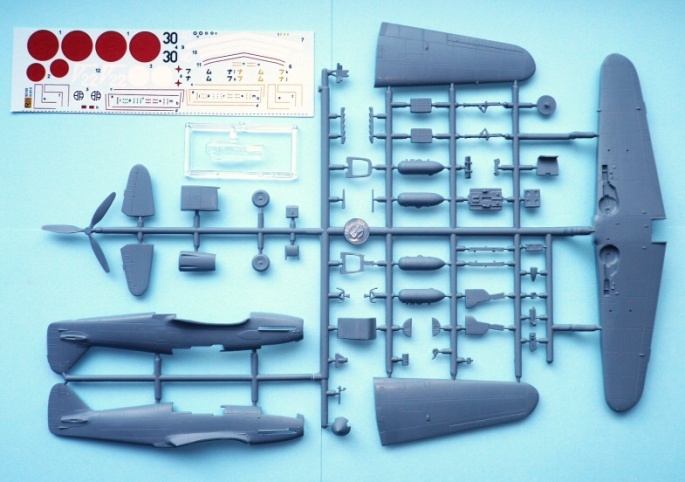 The availability of the Tamiya kit - and its price - make this issue academic. But I hope Tamiya's deft strategy discourages further expensive "magazine issue" kits. The generous Tamiya box can also comfortably house the Fine Molds kit in the stash, rather than the two A4 size boxes it came in. 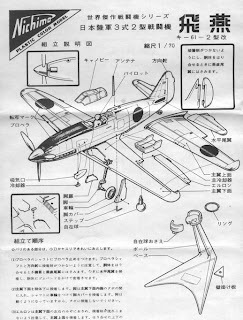 Tamiya suggest their generic XF-71 IJN Interior Green for the cockpit despite the fact that the markings options include both Mitsubishi and Nakajima-built aircraft. They also indicate that the decking beneath the canopy should be painted in the interior green colour rather than the anti-glare colour. Wrong. From Japan comes the exclusive news that last month a unique warbird restoration made its first flight. Former airline pilot Shigatsu B. made a succesfull 14-minute flight in a restored Nakajima Ki-44-II Hei, better known in the West as the "Tojo". Long thought to be extinct, in 2002 a team of wreck hunters discovered a nearly complete 9th Sentai machine in a boggy forested area in North East China. The aircraft had force landed there sometime in 1945. The condition of the wreckage was good enough to warrant full restoration and after lengthy negotiations the wreck was shipped to Japan and a secret restoration project was started in 2004. Although an estimated 70% of the airframe had to be newly built and power is provided by a Russian Shvetsov ASh-82 engine instead of the original Nakajima Ha-109, it is the first time a Ki-44 has taken to the skies in over 65 years. 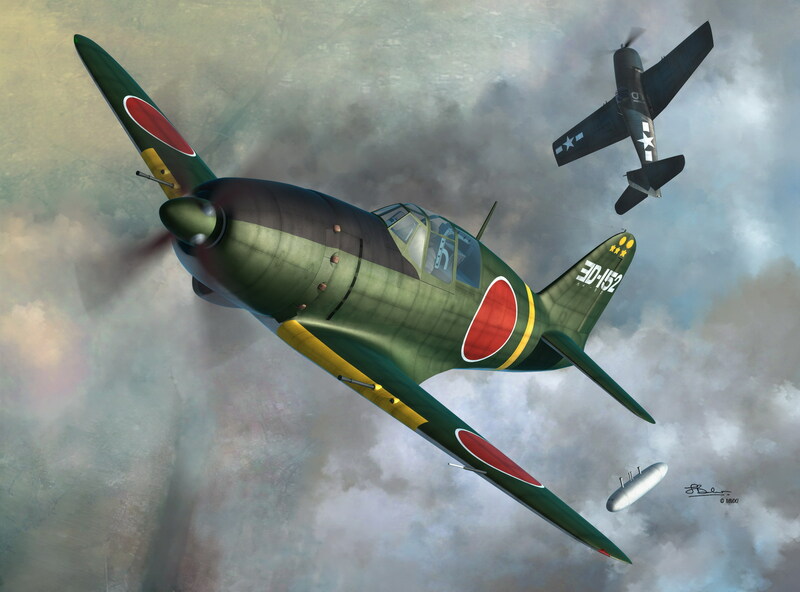 There are yet unconfirmed rumours that the aircraft might be shipped to Europe to participate in some major airshow events in the UK and France, but it would seem more likely that for the next few months the airframe will remain in Japan for further test flying. 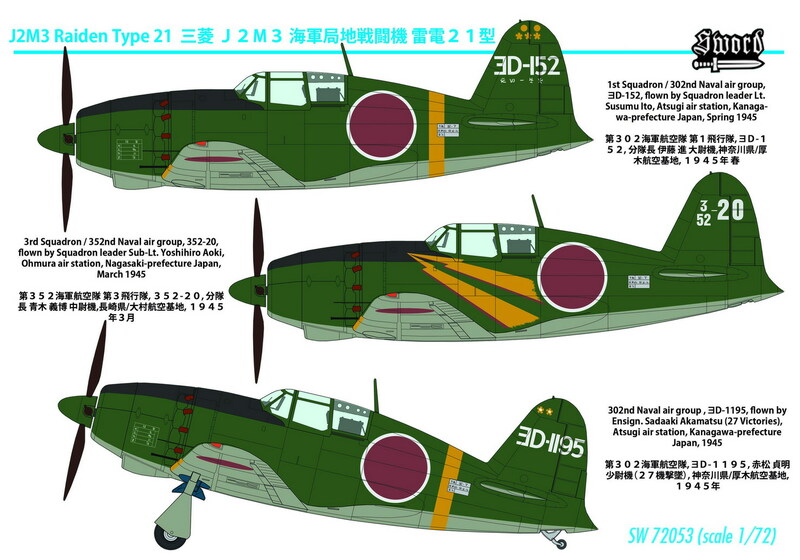 The same team has however confirmed that a Ki-27 "Nate" is currently under restoration as well, with its first flight expected later this year.